HATE is generally a bad thing. Unfortunately, sometimes you cannot help but hating something. 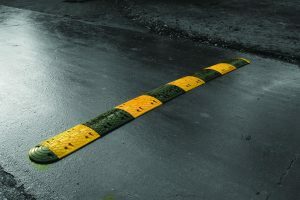 We believe that the speed bumps are one of those things that are hated by at least 99% of the drivers. However, HATE can actually be a good thing. When you hate something so much, it gives you a motivation to change it and make something better. The Smart Bumps project was established by a group of forward looking individuals, which are passionate about challenging the status-quo, making things better and finally make Speed Bumps that we will not hate (we even dare to say that some may even love them). We believe that as much as we all hate them, Speed Bumps are useful devices and we should keep them on our roads. But, we also believe that the DISCOMFORT that we experience passing over them is TOTALLY UNNECESSARY (of course for the ‘good’ drivers). This is the reason why we’ve set as our mission to completely redesign the Speed Bumps, 110 years after the first Speed Bump was implemented in Chatham, New Jersey in 1906. Our team comes from different backgrounds. We strongly believe that this is our big asset as we see things from different perspective and come up with solutions that have the best from all worlds. By combining the best from mechanical engineering with the latest in electronics and SW engineering, we designed the Speed Bump that has all the advantages of the traditional Speed Bump, but none of the drawbacks. It hits the bad drivers, but is nice with the good ones. What is the final product of the company? The final product of the company is an intelligent speed bump, or a ‘Smart Bump’, a speed bump that will behave as the traditional speed bumps for the fast drivers, but will retract for the slow ones significantly improving the driving experience. Our users are all drivers. Everybody that drives a car and is tortured every time he or she drives to work, or to their friends, or to their favorite mall is our user and will benefit from the Smart Bumps. The concept and the design are finalized. We have produced few prototypes and we tested them very hard to make a ‘proof of concept’ and to optimize our designs. We even tested one prototype on a community street. We have one patent application and we will have another application for the improved prototype. We are working hard to find suitable partner network and to establishing the production of the first series. We plan to first produce a small number of Smart Bumps and implement them to a first commercial customer/friendly user to get the real life testing for several months and to use them as demonstration for the later customers. After that we will establish a full production line and you will start seeing the Smart Bumps on the roads near you.